How Does Winter Break Influence Stocks? Folks who were around in 1973 may remember U.S. school holidays like George Washington’s birthday or Abe Lincoln’s birthday, and Standard Time during the winter months. But due to the Energy Crisis, all those things went away in 1974. Daylight Saving Time became year-round and kids had to go to school in the dark, except for a week in February that was later designated as President’s week, so that the schools could conserve fuel during the snowiest, most bitter part of winter. In 1981, kids home from school on the President’s Week break were greeted to summer-like temperatures near 70F (21C) degrees. The warmth was unprecedented and record shattering. As a result, the weather models had difficulty interpreting the data for a long, long time. In fact, the effect was so profound that more than a year later the models failed to predict the blizzard that pummeled New York city on April 7, 1982. Events such as these are outliers, or what some would consider a 3-sigma occurrence (because it generally takes a 3-sigma move in stock prices to generate a significant profit on the Long Straddle option trades that define Lottery Fever). Such rare events tend to make models unreliable, whether it is in weather forecasting or the stock market; and the effect can linger for quite a bit of time. Lottery Fever can be considered an outlier. Although it occurs more frequently than 70 degree days in February or a blizzard in April, it is still a relatively rare event. 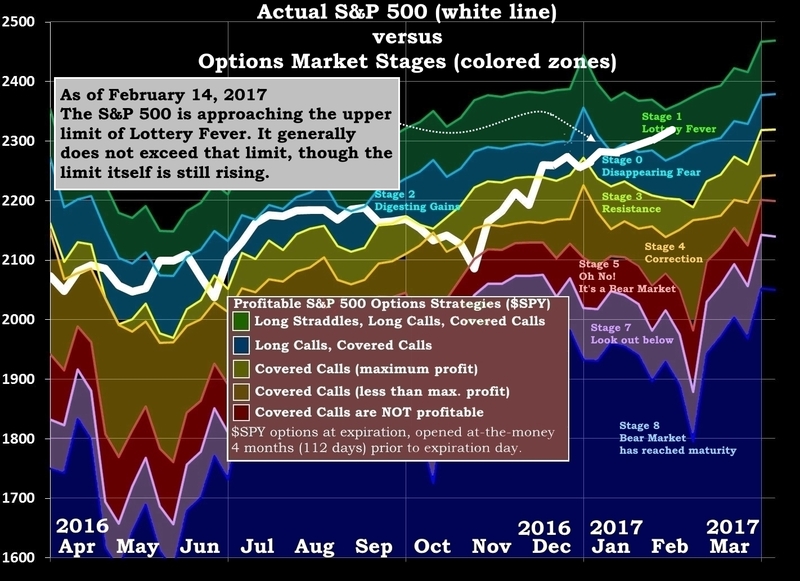 Thus, the recent entry of the S&P 500 into the Lottery Fever zone suggests it could make the stock market much more unpredictable for a time. When one decides to “boldly go where no man has gone before” one is bound to find things that were unexpected; and the S&P, Dow and Nasdaq have clearly boldly gone where they have never gone before.